The Canadian Contemporary Music Workshop is a vital cultural conduit for emerging Canadian art music. It was formed in the spring of 1983 by a group of composers and musicians, including Samuel Dolin. It is presently run by a collective of three of Canada’s most promising young composers – Craig Galbraith, Abigail Richardson and Andrew Staniland. Previous pieces workshopped by the CCMW have gone on to win prestigious national and international prizes including the SOCAN Young Composers awards and the International Rostrum of Composers. The Composers' Orchestra is the performing arm of the CCMW and has several recordings available on CBC Records. Our statement of purpose reads "The CCMW promotes the creation and performance of works by Canadian composers, the interaction of composers and performers, and the wider appreciation of our own creative community." The CCMW provides a unique opportunity for emerging Canadian composers to have their new works reviewed, evaluated and performed by professional musicians. This is accomplished through concerts and workshops, which allow composers to interact closely with professional musicians, gaining valuable feedback from them. Over one hundred composers have received their first professional performance by the Composers' Orchestra, and many have gone on to have international composing careers. No other organization has integrated itself into the musical fabric of our community so tightly. Our role bridges the formidable gap between education institutions and the professional world. From 1987 to 2003, Gary Kulesha was the Artistic Director of the Composers' Orchestra. 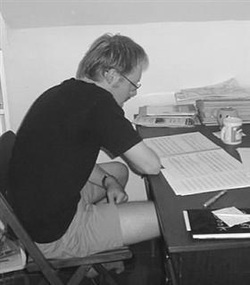 In December of 2003, Kulesha passed the torch to three young composers, Craig Galbraith, Abigail Richardson, and Andrew Staniland to act as the Managing Artistic Advisory Board. [see the list of current board members] We are dedicated to promoting and programming emerging composers within the context of the rich history of Canadian music. Each workshop and concert is based around an established Canadian composer. This combined focus on emerging and well-established composers anchors the new music to the tradition of Canadian music, and creates a valuable encounter between emerging talents and legends in Canadian music. The CCMW is very proud of its unique role in identifying, promoting, and nurturing emerging Canadian artists, and is committed to the sustained success of its mandate. Over the years, the Composers' Orchestra and the CCMW have performed and premiered new works by an impressive number of Canadian composers. Some of Canada's most established talents have participated in CCMW events. The following list is a just a sample of some of the composers the CCMW has featured.